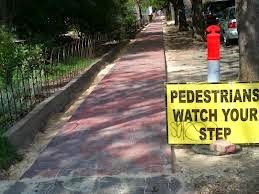 At the beginning of this Council term it had become obvious that the footpath replacement programme was lagging behind. I wasn't going to take forever to finish but is was going to take until at least 2034 which seemed like nearly forever for those streets that were still waiting. These streets were probably last bituminised in the 1970s (if they were lucky). We have been reassured by staff that we are still anticipating the completion of the acceleration programme in 3-4 years. It was my efforts, with the support of Don, that saw this happen. The streets to be done 2014/15 are Cromer Pde, Hammond St, Birkdale Ave and Lynton Ave. Those that remain to be completed are Kelvin Ave, Cowper Rd, Laught Ave, Winifred Ave, Hill Crt, Eglington Ave, Gray St, Selkirk Ave, Hachett Ave, Ellesmere Tce, Irwin Ave and Argyle Ave.